Experts believe China’s coal consumption has permanently peaked. After more than tripling between 2000-2013, when China overtook the US as the world’s top greenhouse gas producer, coal production has been dropping: 2.9% in 2014, 3.6% in 2015, and a dramatic 9.7% in the first half of 2016, according to research published in Nature Geoscience. Another 9% of China’s coal capacity will be eliminated in the next few years with new mines banned and 4300 small, inefficient mines closing. And last year, China pledged to cut emissions from coal-fired power plants 60% by 2020. The causes: China’s economic growth has been cut by half and is moving toward a “consumer” service-based economy and away from heavy, energy-intensive industry. And pollution is so bad it’s become impossible to ignore, spurring government action. The impact of climate change has also become impossible to dowplay, from severe droughts in the north to torrential floods in the south. Then there’s China’s outsized leadership on solar and wind, installing eye-popping amounts for years now. Newly raised targets are for an amazing 150-200 gigawatts (GW) of solar by 2020 (up from 70GW), and 250 GW of wind (up from 200GW). Since China’s promise is to peak emissions by 2030, this is way earlier than anyone expected. Now they could peak as early as 2020! Not coincidentally, global greenhouse emissions have been flat for the past two years. “I think it is a real turning point. I think historians will see it as a very important event in the history of the climate and economy of the world, Climate Economist Lord Nicholas Stern told The Guardian. “This may well be a turning point in international efforts to cut emissions of climate-altering greenhouse gases,” concludes Lord’s team from London School of Economics and Beijnig’s Tsinghua University, who conducted the research. Researchers note that this is the same path taken by other “affluent industrial economies,” such as the US and Britain. 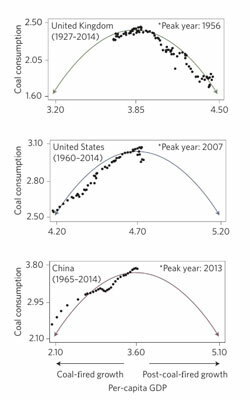 At this point, however, we can no longer be satisfied with enormous users like China plateauing coal use. Climate change has advanced so much that coal has to becompletely phased out by about 2035 to stay below 2°C (3.6°F), Professoor John Schellnhuber at Germany’s Potsdam Institute for Climate Impact Research, told The Guardian. He is one of the world’s top climate scientists. Read our article, Global Emissions Fall This Year, Coal Use Peaked in 2013! Previous Previous post: Tesla and SolarCity Merge!